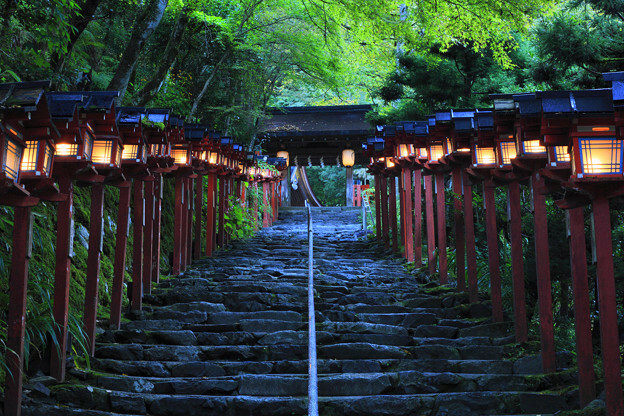 Shinto Shrine – from the Imperial shrines to local shrines, there are more than 80,000 Shinto shrines all over Japan. It’s more than all the convenience stores combined which they say you find every corner. Let’s take a look at its history and architecture, its crest and the relationship with the Japanese people. First of all, there was no shrine before Buddhism was introduced in Japan. 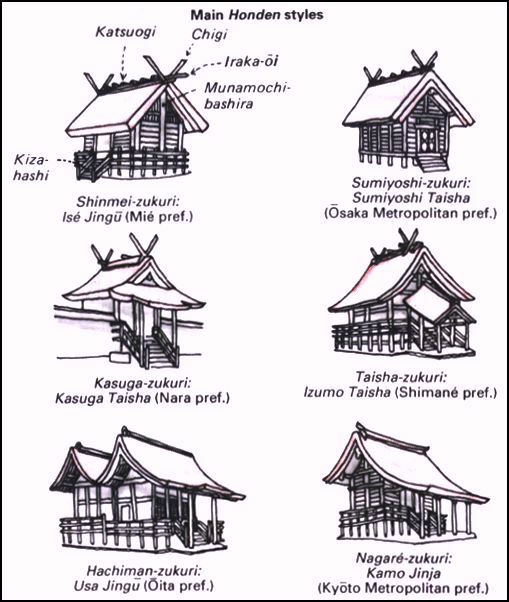 Shinto didn’t have any buildings, no founder or scripture like a dogma system. 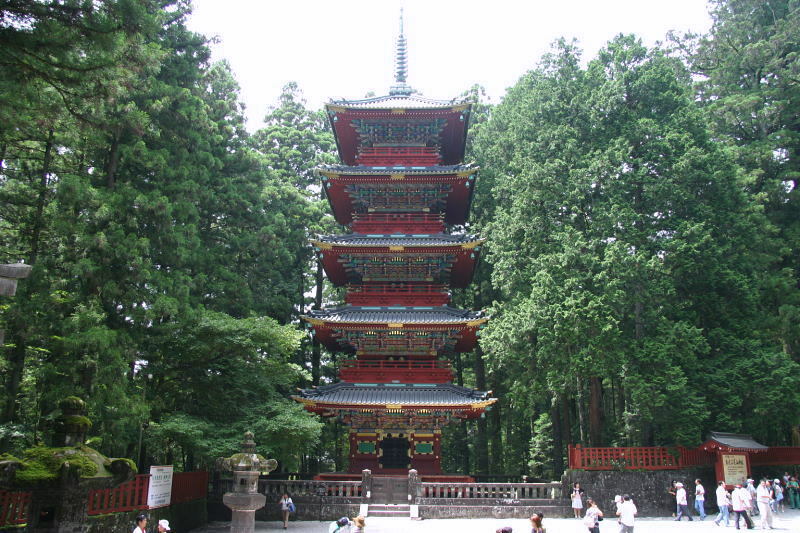 It was in the Asuka period (around the 7th century) when the Buddhism was introduced, the shrines appeared under the policy of making Japan with the centralized government system to protect against other countries, instead of just praying for nature. In Shinto, people find spirits and deities in everything, literally in everything. Shinto beliefs are based on nature worship, ancestor worship, Imperial family worship, and a deification of the notable dead. Especially in ancient Shinto, they assumed the trees and mountains, rocks and rivers as the kami (Shinto deities) and marked as a sacred place. These objects functioned as a border between the secular world and the sacred world of the kami. Once the government had local priest under control, gave Shinto privileges over Buddhism as a counterweight, they needed to have an equivalent facility to a Buddhist Temple, hence a Shinto Shrine. Ancestors of the Imperial family didn’t force people to stop respecting and praying for their local kami, so a Shinto Shrine often has more than one kami. 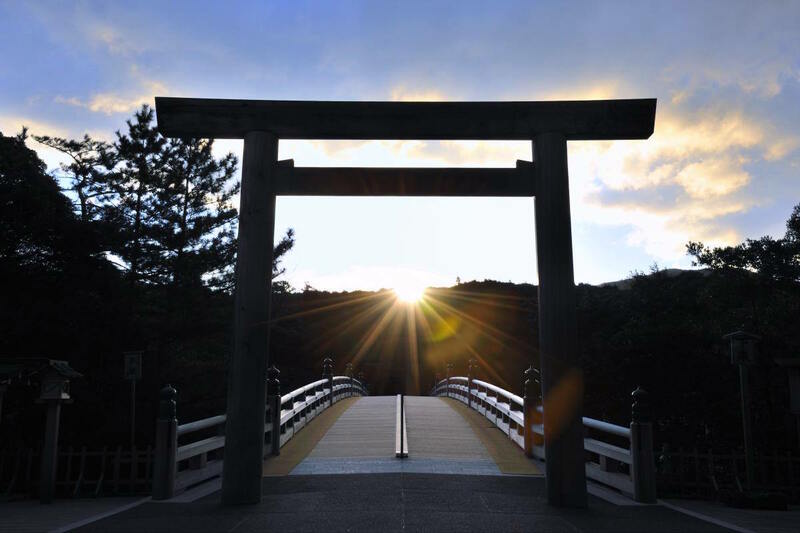 A religious corporation called “Jinja Honcho” unifies shrines all over Japan systematically now and Shinto Shrines are the permanent religious facility; rituals, ceremonies, and festivals are considered to be the most important aspect of Shinto. 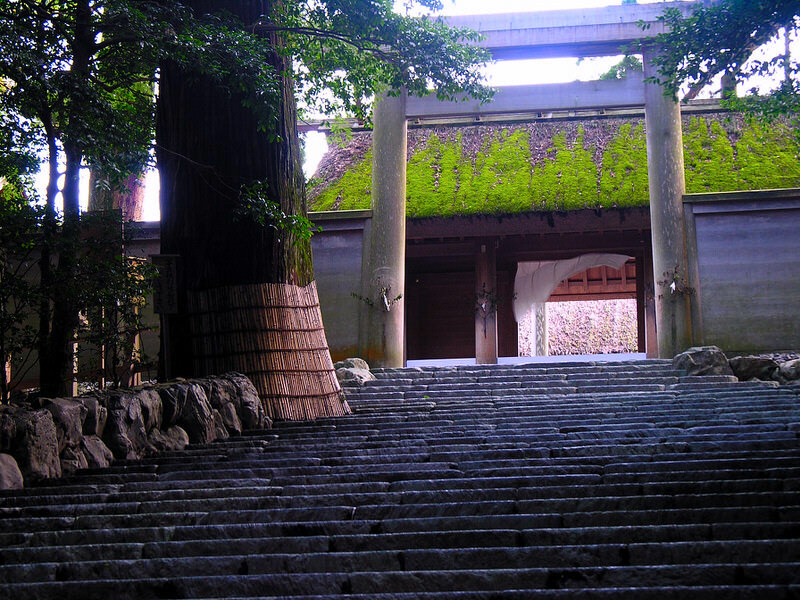 Depending on the shrine’s architecture style, Honden (the main hall) and Haiden (the offering hall) are two separate buildings or combined into one building. The main hall’s innermost chamber contains the shrine’s sacred object (often called Goshintai), while visitors make their prayers and offerings at Haiden (the offering hall). The Honden is built behind the Haiden. One also often finds a third structure between Honden and Haiden called Heiden (the hall of offerings), open only to the priests when they are making offerings on behalf of devotees. 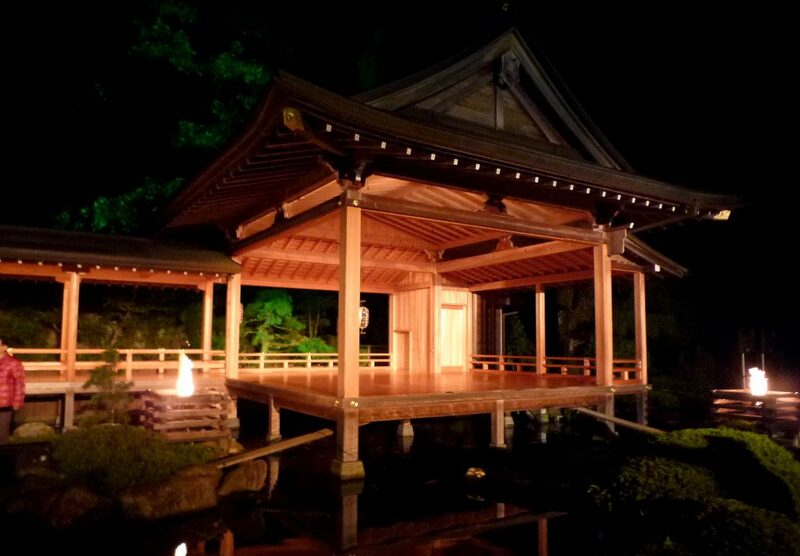 Important functions of Shinto shrines are the cultivation and preservation of ancient art forms such as Noh theater, kagura dance, and gagaku (court music). Get your copy on Amazon: Shinto Shrines: A Guide to the Sacred Sites of Japan’s Ancient Religion With over 100 color photos, fifty black-and-white detailed illustrations, and maps, this handy guidebook showcases sixty-six major Shinto shrines, many of which are World Heritage Sites or National Treasures. 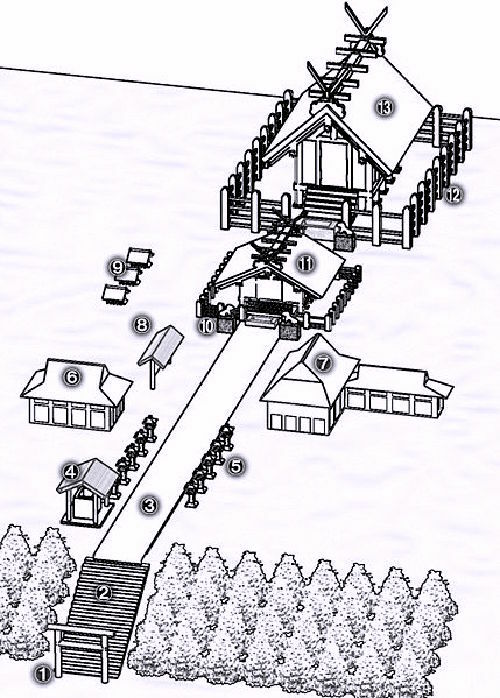 Stages for kagura dance or noh theater performances can be found at some shrines. As you can see the Noh theater above, Noh was originally played at the stage of a shrine. One or more torii gates mark the approach and entrance to a Shinto Shrine and most of them are made of wood. Shrines almost always have them to demarcate the secular everyday world to the sacred area inside the shrine. Some simple torii gates are made of stone and coated with moss if they are old in the forest which blends in nature really well. 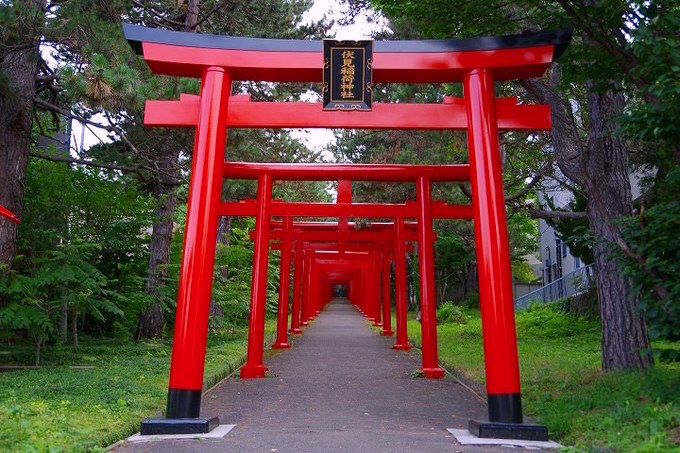 On the contrary torii gates which are painted red or orange and black stands out and catch the eye and effectively shows people there is shrine behind it. Although we sometimes call them gate for descriptive purposes, it has no doors to close, it’s always open to the world. Torii literally means bird perch and there is a description of it in Japanese mythology as an important factor. In a limited sense, Sando is a path inside a torii gate, while it can mean all the path which lead to the shrine in a broad sense. 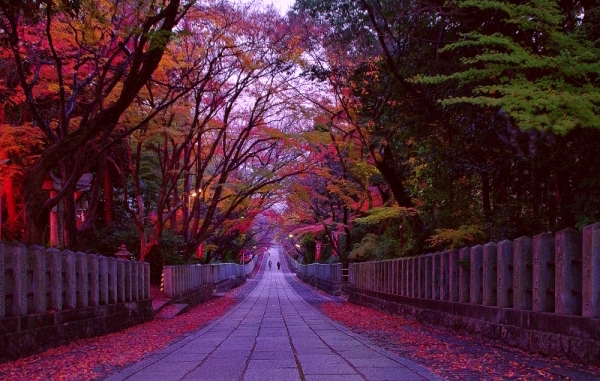 Some shrines have more than one Sando, then the main path is called Omote-Sando. 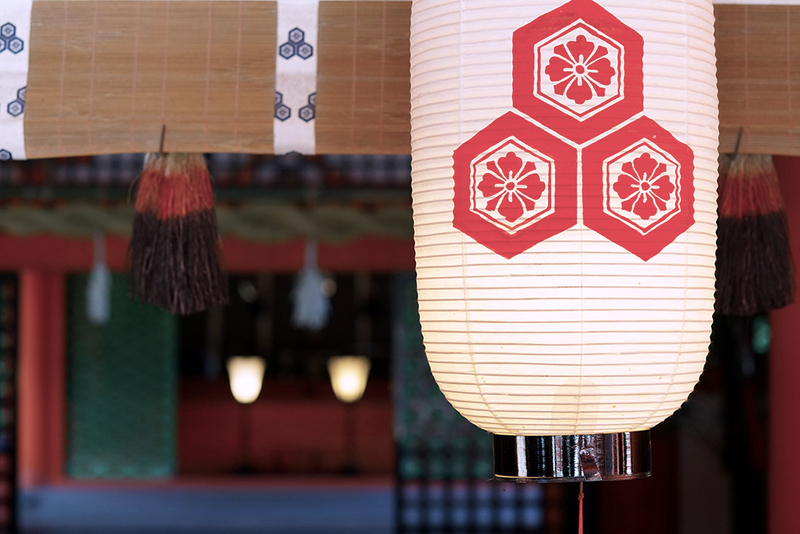 Toro is one of the traditional luminaire which has been used to light up the Shinto rites, usually no light in those lanterns in a usual occasion. Most of Toro in shrines are made of wood or stone. There is a portable lantern which is used as a foot light called “Kageto”; it’s a box with a candle in it, which gives dim light to keep the darkness when the rites (especially funeral ceremony of Shinto) are performed. 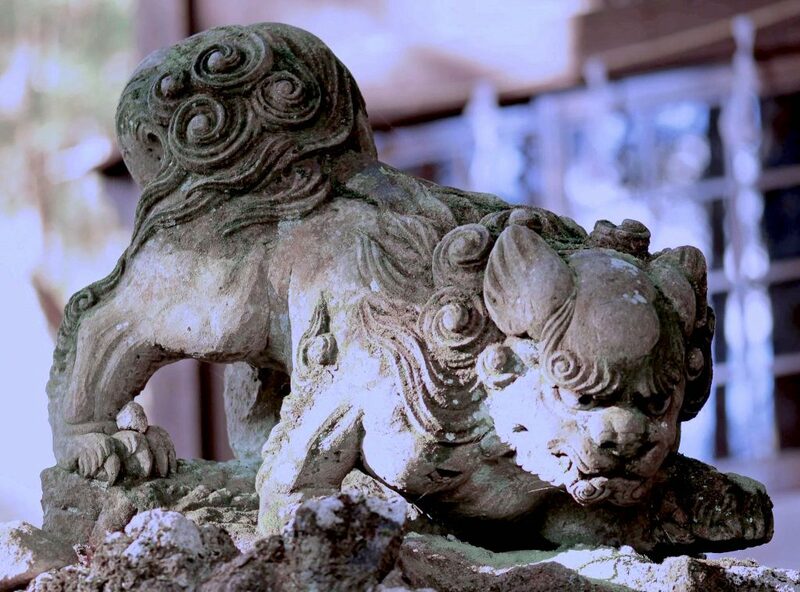 A pair of Shishi (lion-dog) are called Komainu, often found on each side of a shrine’s entrance or in front of the haiden. Furthermore, on the eaves of both shrine roof, one can frequently find carvings of this mythical beast. As guardians outside the shrine gate, one Shishi is depicted with its mouth open (to scare off evils) and the other with its mouth closed (to shelter and keep in the good spirits). The combination is said to symbolically represent birth and death. This mythical and magical beast was probably introduced to Japan from China via Korea in the 6th or 7th century, during the same period as Buddhism was introduced. Found near the entrance, the water of these fountains is used for purification. You are supposed to clean your hands and mouth before approaching the haiden or the honden as it is not appropriate to come close to deities with impurity. First, the left and then the right hand is rinsed with water at the purification font, then the mouth is rinsed with water from the left hand. 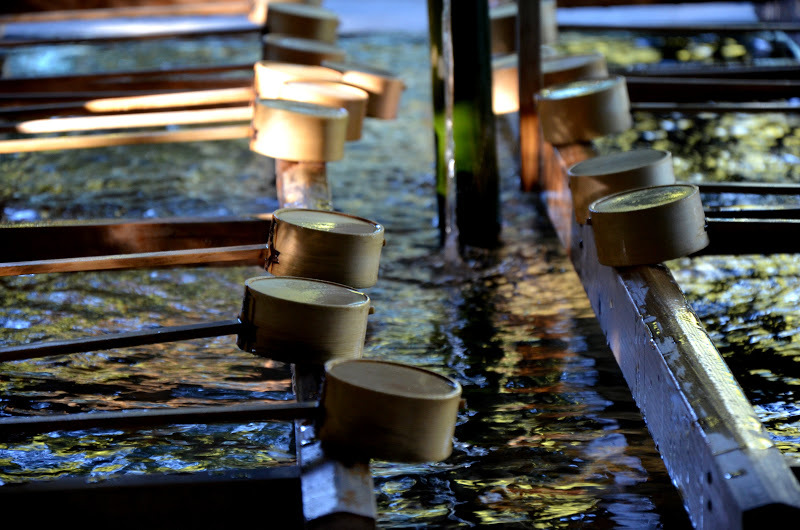 Purification is an essential element in Shinto and agents which provide purification are water, salt, fire, sand, and sake (rice fermented alcohol). Sometimes, in the shrine compound, there will be an incense burning, and people will waft the smoke over their heads to catch the blessings of the deity or to burn away impurities. Some Japanese still practice the old tradition of sprinkling water at the gate of their home in the morning and evening to purify the family environs. Shimenawa is a rice or hemp straw rope with white zigzag paper strips which is called “shide”. It marks the boundary of the sacred place and can be found on torii gates, around sacred trees and stone, etc. 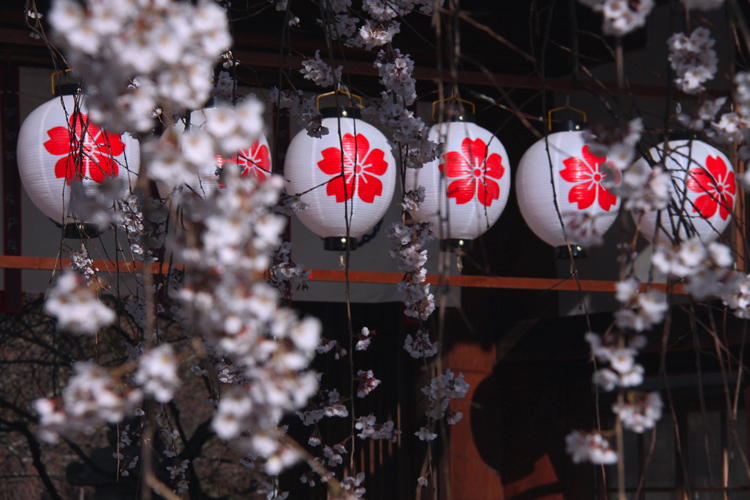 They symbolize purity in the Shinto faith. 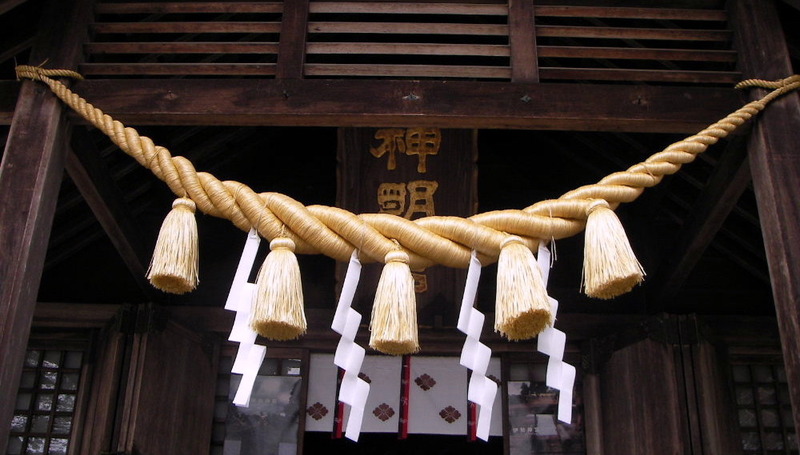 A rope similar to the shimenawa is also worn by yokozuna, the highest ranked sumo wrestlers during ritual ceremonies. 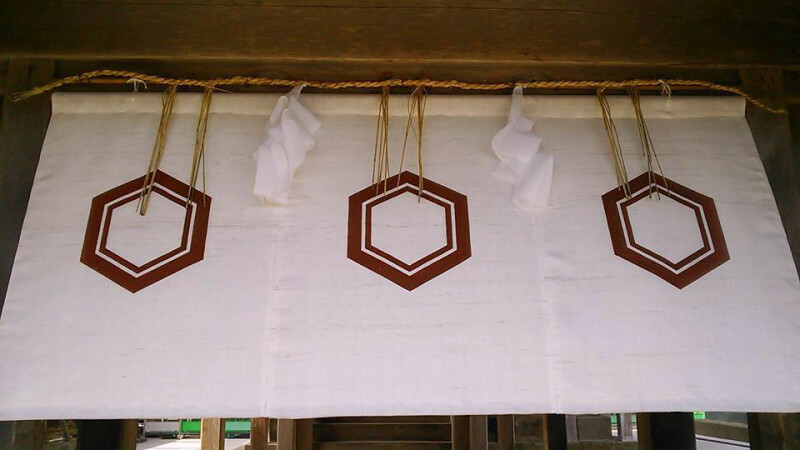 Merchants and businesses, as well as private individuals, often hang the shimenawa on their front doors at special times of the year. One also often sees the tamagushi, a sprig of sakaki (cleyera japonica) with attached shide used by Shinto priests at ceremonies. What is enshrined in the main hall? Quite roughly, various kami (Sinto deities) are enshrined and it can be numbers of kami. the sun, the moon, the stars, the fire, the storm, the wind, the fog, and so on. serpent, a large tree, dragon, wolf, cow, fox, bear, and so on. Amaterasu-Omikami (the sun deity), Okuninushi (deity of Izumo), Ninigi-no-Mikoto (grandson of Amaterasu and ancestor of the Imperial family), and so on. Emperor Meiji and Empress Shokei, Toyotomi Hideyoshi, Tokugawa Ieyasu, Nogi Maresuke and Nogi Shizuko, Togo Heihachiro, and so on. There are distinctions among kami which are enshrined; the main kami, partner kami and other kami. Get your copy on Amazon: A Year in the Life of a Shinto Shrine by Nelson Joh (Author) A Year in the Life of a Shinto Shrine describes the ritual cycle at Suwa Shrine, Nagasaki’s major Shinto shrine and John K. Nelson’s observations of over fifty shrine rituals and festivals. Shrine Crest aka “Shinmon” is a unique crest which belongs to each shrine in Japan. It identifies from Kamon (Family Crest) and designs of plants or good luck charms which related to each shrine were created. It began appearing around the Heian period (724-1185) and numerous shrines began to have its own crest in the Kamakura period (1192-1333). At the time, some family crests had used as shrine crests and vice versa. 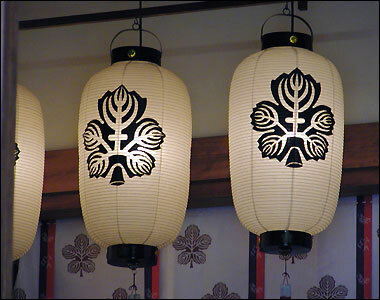 The sacred trees, festival instruments are often seen in designs of Shinmon for each Shinto Shrine. In Tenmangu which Sugawara-no-Michizane is enshrined as the kami, they have shrine crest of Japanese plum which Michizane was fond of. 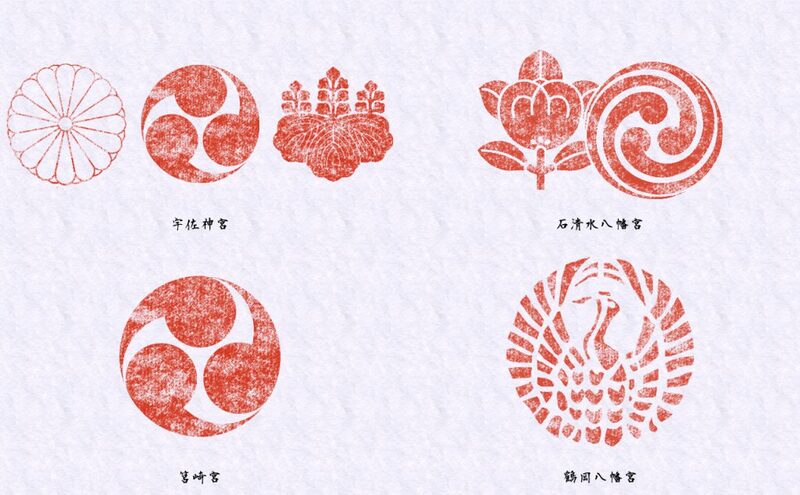 The motif of Shinto shrine crest ranges from the syncretism of Shinto and Buddhism or astronomical or meteorological phenomenon pattern, folklore to legends, which shows the symbol of people’s belief and historical background. Aside from the various types of Shrines, particular Shrines are called “Jingu”, “Miya”, and “Taisha” instead of “Shrine”. It used to be only two “Taisha” (large shrine) which is Izumo Taisha and Kumano Taisha both in Shimane before, now we have 26 other Taisha. 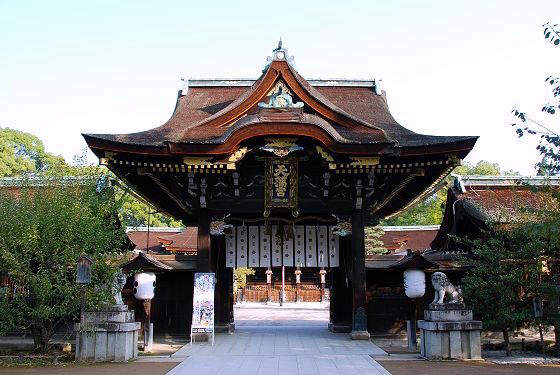 Shrines which enshrine Emperors or kami in mythology are called “Jingu” and “Miya” enshrines the Imperial family. They are directly funded and administered by the government during the era of State Shinto. 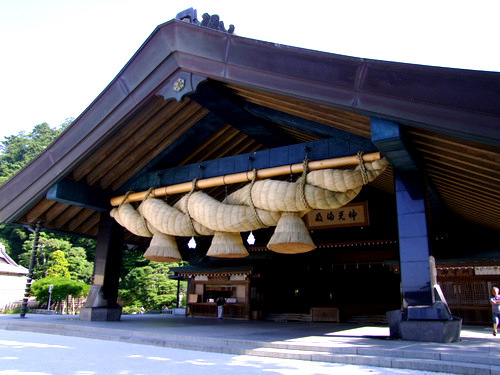 They include many of Shinto’s most prominent shrines such as the Ise Jingu, Izumo Taisha, and Atsuta Shrine. 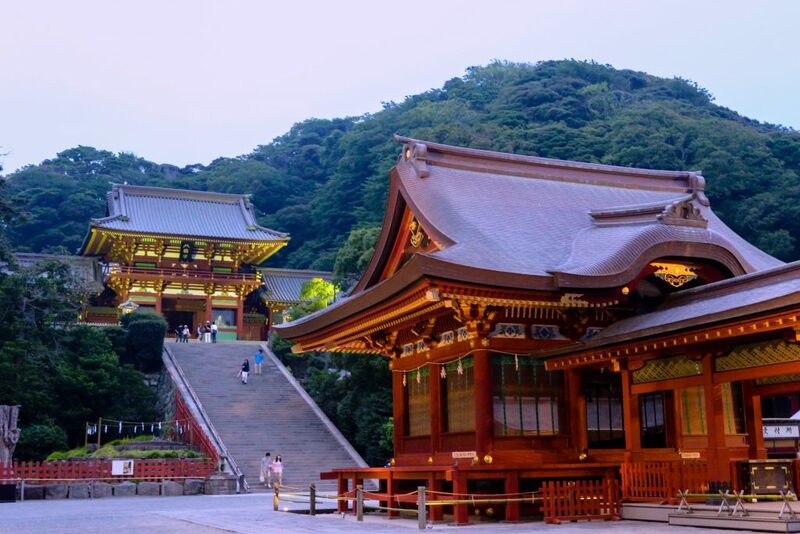 A number of shrines newly built during the Meiji period, such as Meiji Jingu in Tokyo and Heian Jingu in Kyoto. Imperial Shrines can be recognized by the Imperial family chrysanthemum crest. Shinto sites associated with the imperial family typically enshrine three items (not typically displayed to the public) — a sacred mirror, sword, and jewel. These three are known as the Imperial Regalia of Japan (Sanshu no Jingi), also translated as the Three Sacred Treasures. 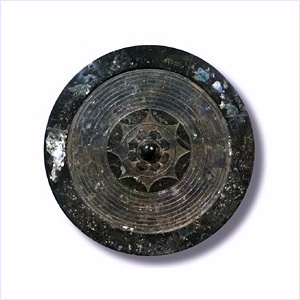 The sacred or divine mirror, known as the Yata-no-Kagami is a symbol of the sun goddess Amaterasu. Japan’s imperial family claims direct descent from her lineage. 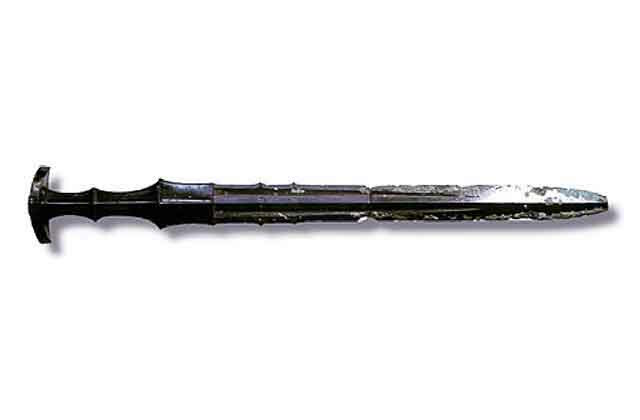 The sword, Kusanagi-no-Tsurugi, was found in the tail of the dragon slain by her brother Susano-O-no-Mikoto. 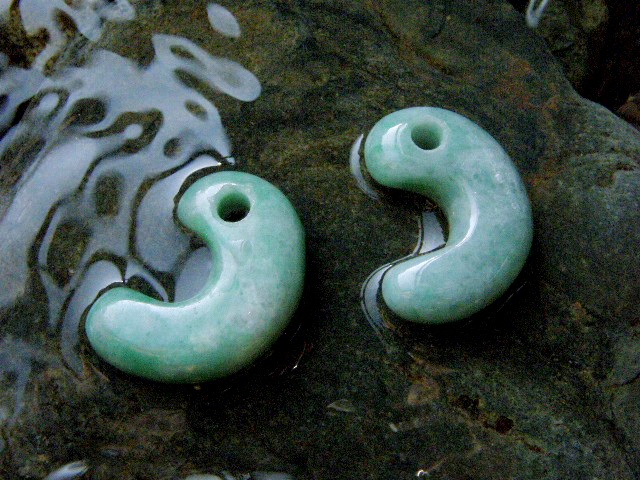 The Yasakani-no-Magatama (curved jewel) is a Shinto talisman of good fortune and it symbolizes “avoidance of evil” or the “magic of good fortune”. Some say representing the mother’s womb or embryo and hence came to mean all good things, like the blessing of a new child, growth, longevity, and prosperity. The mirror and jewel are said to belong to Amaterasu. The three regalia also represent three virtues, with the mirror representing wisdom, the sword representing valor, and the jewel representing benevolence. It is commonly believed that the original mirror is located at the Ise Grand Shrine in Mie, the sword at Atsuta Jingu in Nagoya, Aichi, and the Jewel at the Imperial Palace in Tokyo. 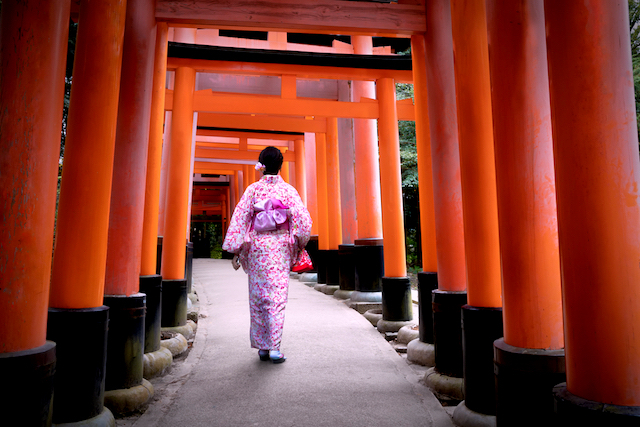 Inari Shrines are dedicated to Inari, the kami of rice. 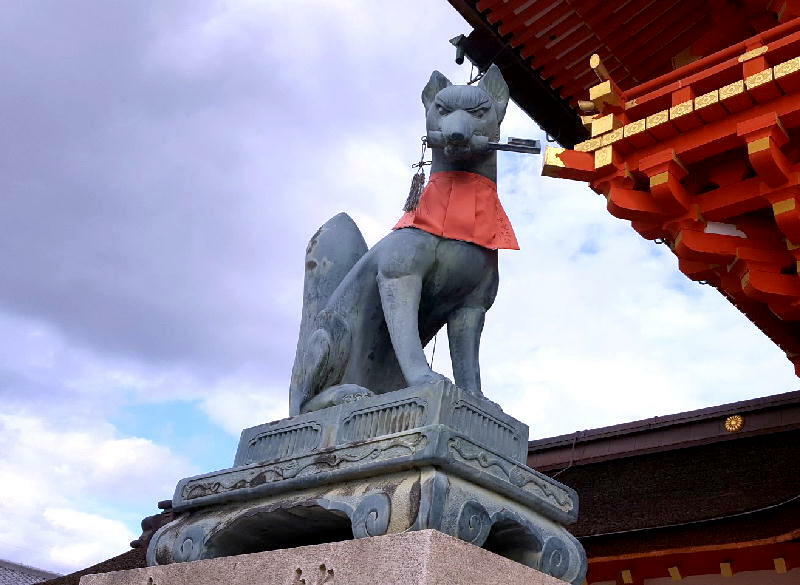 They can be recognized by fox guardians at the entrance, which is considered to be the messengers of Inari. There are thousands of Inari Shrines in stores, on the rooftop of the company’s buildings, and at the site of factories, literally all across Japan. Uakano-Mitama-no-Kami is enshrined and originally associated with a great harvest of kami, now the success in business as well. The headquarter is Fushimi Inari in Kyoto. It’s used to be called Yawata, now usually called Hachiman Shrines are dedicated to the kami of war, which used to be particularly popular among the leading powerful military clans of the past. The Emperor Ojin was deified as kami and the headquarter is Usa Jingu in Oita. Tenjin Shrines are dedicated to the kami of Sugawara Michizane who was an excellent scholar and a politician in the Heian period. It’s said he was dead with wrath under the political trouble, so people enshrined him to calm his soul. They are particularly popular among students preparing for entrance exams. 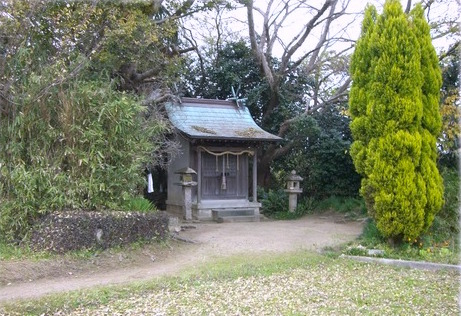 Tenjin Shrines can be recognized by ox statues and plum trees which Michizane’s favorite. 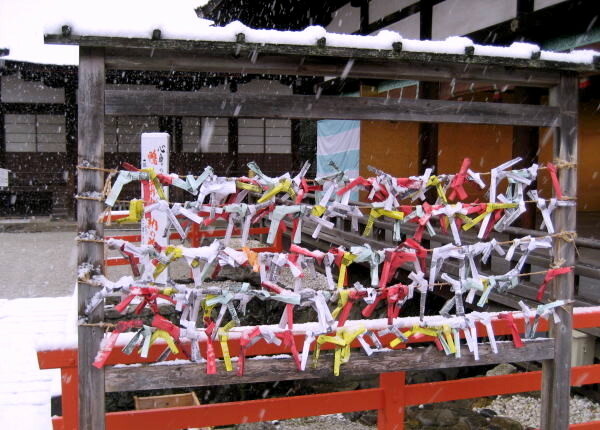 Sengen Shrines which used to be called Asama Shrines are dedicated to Konohana-Sakuya-Hime, the Shinto deity of Mt. Fuji. She has associated with the volcanic Mt. Fuji because he gave birth inside the hut which was burning in Japanese mythology. More than one thousand Sengen Shrines exist across Japan, with the head shrines standing at the foot and the summit of Mount Fuji itself. Some powerful clans in Japanese history established and dedicated shrines to their clans’ founders. The most famous example are the several dozens of Toshogu Shrines dedicated to Tokugawa Ieyasu, including the famous Toshogu in Nikko. They are the most familiar and closest Shrines to people, which dedicated to local kami without association to other shrines. The local Shinto deity at a local Shinto Shrine is the one you have to pay attention the most since they protect you and support you in the close distance. There are more shrine types than we showed above such as Shinmei Shrines which are dedicated to Amaterasu Omikami (the sun deity), Kasuga Shrines which are dedicated to Takemikazuchi-no-Kami (kami in mythology), and Futsunushi-no-Kami (the sword). Shrines offer many lucky charms to visitors. It comes in various forms and most, if not the all, wishes people make would be supported by those charms. Nearly all shrines sell talismans to bring good luck or keep evil away. Most shrines sell fortunes called Omikuji. Omikuji are fortune telling paper slips. 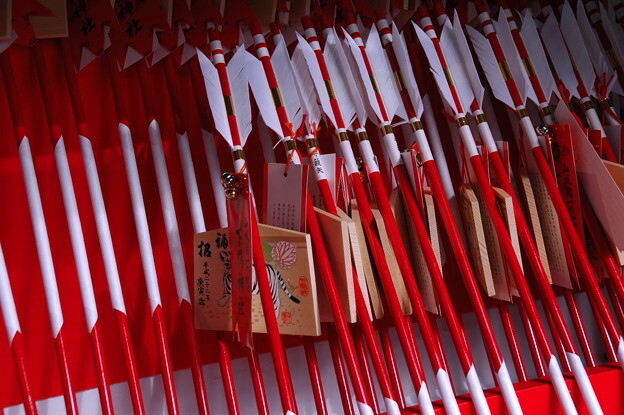 Just look for a small rounded container filled with bamboo sticks at the shrine kiosk. Pay the attendant (typically 100 yen), pick up the container, give it a shake, and a long stick will pop out of a small hole at the top. 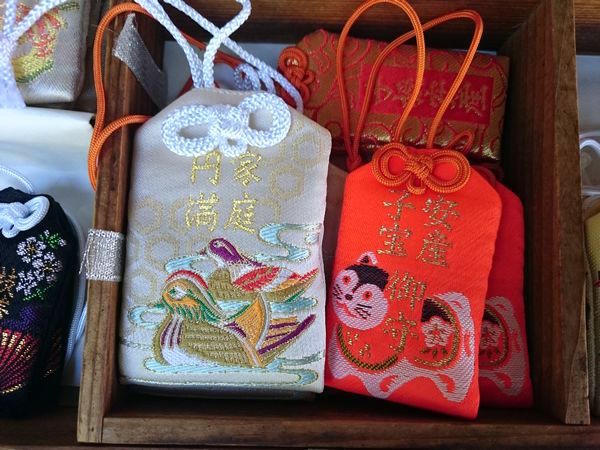 Shinto protective amulets, Omamori cover the wide range of wishes people ever make and is supposed to give you divine protection, health support, success in business, and wonderful relationships. It has to be close to your body once you get them, like in your purse. Its ‘expiration date’ is a year, however, you can keep Omamori as a protection as you like. The edge of Hamaya is not sharp, it’s because its target is not a person nor an object, but the negative and evil spirits. What is not well-known is you shoot an arrow with a bow and the benefit can be expected. At most shrines, one finds a stand with hundreds of small wooden plaques attached to it. 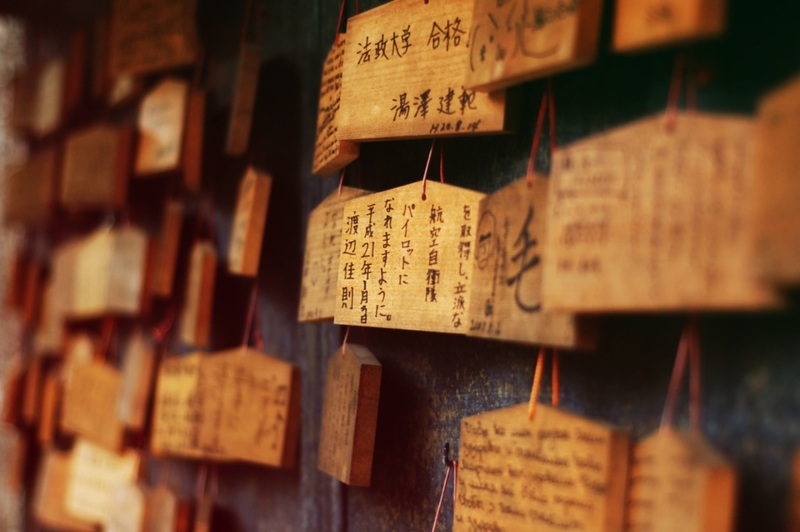 Visitors write their wishes on these wooden plaques and then leave them at the shrine in the hope that their wishes come true. Most people wish for good health and wealth, passing entrance exams and success in business, find a true love and keeping good relationships. Their surface can either be plain or inscribed with wishes (hope) in kanji character, pictures of animals, flowers, or anything else the shrine they belong to is famous for. The image on the ema may explain what it will be most effective for (health, money, love, study, etc), and larger temples often carry more than one kind. There is an episode in Nihon Shoki that Emperor Richu hid in the Ishigami Shrine trying to escape from the powerful figure at the time. In The Scroll of Ippen Shonin which was completed in 1299, you can see a lot of beggars gather at a shrine in the town, it shows us Shinto Shrines have been the sacred place and open space for everyone. 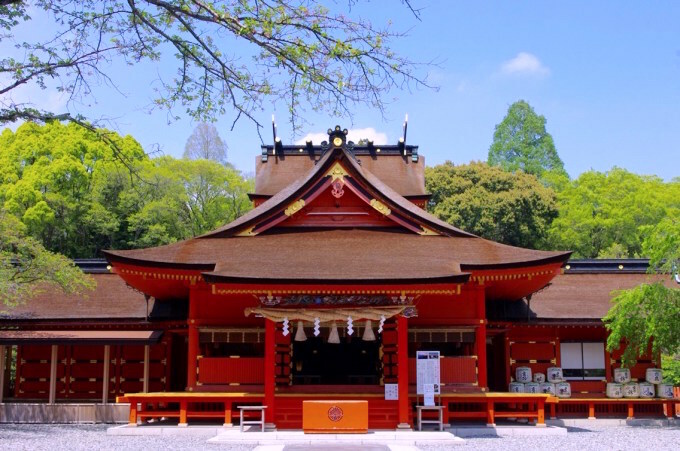 Japanese people go to the shrine whenever they feel like doing so and at various turning points visits are made on the belief of Shinto pray for divine protection and to give thanks for the deities’ blessings. These rites of passage with Japanese begin with “Hatsumiya moude”, which is a ceremony celebrating the very first visit of a newborn baby to a local shrine so that the kami (deity) can recognize her/him as a new member of the community. The next is called “Shichi-Go-San”, boys in their fifth year and girls at their third and seventh year, visit a shrine to report their healthy growth and to receive divine protection and blessings. At festival times, Shinto Shrines become full of people, especially on the Eve of the New Year and the New Year for celebration. Shinto Shrine welcomes anyone no matter what they believe, if that someone has a courtesy and respect for the environment, people, and nature. It gives a calm and serene experience once you step inside the shrine as the chatter in your head naturally quieted down. The architecture and design of a Shinto Shrine bring a deep sense of the spirituality which makes you forget mundane things behind the torii gate. It’s a great place to feel the harmony between humanity and the natural world, to reclaim your inner silence and energy charge.